Beneath the waves stirs a malevolent, giant kraken-like alien monster-god whose abode is an ancient lost city in Antarctica: R’lyeh—the terrifying creation of American fiction writer H.P. Lovecraft. First brought to life as part of his short story “The Call of Cthulhu,” published in the magazine Weird Tales, and later featuring in several of Lovecraft's works, Cthulhu is an iconic figure that has inspired imagination and terrified generations. Its name has come to define the whole mythos built up around Lovecraft's strange worlds and pantheon of alien gods that inspire many writers to this day. 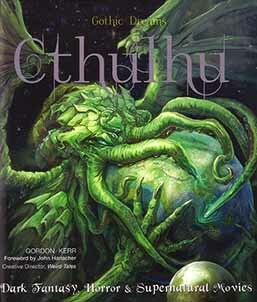 In this deluxe book, punchy text describes how fantasy art, literature, movies and games have been influenced by the terrifying alien squid-like god Cthulhu. Chapters include: The Call of Cthulhu; Master of Horror; Creating Cthulhu; The Cthulhu Mythos; Horror Stories; Cthulhu on Screen; Fun and Games; R’lyeh Good Art; A Monster Universe; more. A super-deluxe book packed with amazing illustrations, published at $18.00, our special sale price only: $14.95. Every Cthulhu library must have this cool book!